The Centre of our Galaxy, the Milky Way, is a target of prime important for the H.E.S.S. experiment, first because it harbours the nearest, super-massive black hole (Sgr A*), but also because many exotic phenomena, including annihilation of dark matter particles, could take place in this extreme environment. Due to its southern location, H.E.S.S. can observe it under the best conditions, close to zenith and with a low energy threshold. That region has been covered in several of our Sources of the Month: 03-2016, 12-2009, 03-2006 and 12-2004. In a new analysis of a 10-year observational dataset, H.E.S.S. analysers have found the origin of the large gamma-ray glow around the centre of our Galaxy, the Milky Way. The shape and energy spectrum of this gamma-ray emission indicates that an unprecedentedly violent particle accelerator might lurk in its very heart. If so, it is the first time a Peta-Electronvolt (PeV) particle accelerator is found in the Milky Way, which might be a crucial piece of the puzzle of high-energy cosmic rays. The Earth is constantly bombarded by high-energy particles (protons, electrons and atomic nuclei) of cosmic origin, particles that comprise the so-called “cosmic radiation”. These “cosmic rays” are electrically charged, and are hence strongly deflected by the interstellar magnetic fields that pervade our galaxy. Their path through the cosmos is randomised by these deflections, making it impossible to directly identify the astrophysical sources responsible for their production. Thus, since more than a century, the origin of the cosmic rays remains one of the most enduring mysteries of science. The energy spectrum of Cosmic Rays (CRs) extends without any major feature until particle energies of few PeVs (1 PeV = 1015 electronvolts), where it steepens originating a feature called the knee. This implies our galaxy hosts PeVatrons -- extreme particle accelerators reaching such PeV energies. Today there is a broad consensus that cosmic rays with energies up to approximately 100 TeVs (1 TeV = 1012 electronvolts) are produced in our Galaxy, by objects such as supernova remnants and pulsar wind nebulae. Their detection is possible thanks to the interaction of these cosmic rays with the light and gas in the neighbourhood of their sources, thus producing γ-rays. However none of the currently known accelerators observed by Atmospheric Cherenkov Telescope Arrays have yet shown the characteristic signature of PeV particles, namely, power-law spectra of γ-rays extending without a cut-off or a spectral break to tens of TeV. Detailed observations of the Galactic centre region, made by H.E.S.S. over the past ten years, and published in the journal Nature , finally provide strong indications for such PeV cosmic-ray acceleration. During the first three years of observations, H.E.S.S. uncovered a very powerful point source of gamma rays in the galactic centre region (HESS J1745-290), as well as diffuse gamma-ray emission from the giant molecular clouds that surround it in a region approximately 500 light years across ) (see Figure 2). These molecular clouds are bombarded by cosmic rays moving at close to the speed of light, which produce gamma rays through their interactions with the clouds' material. A remarkably good spatial coincidence between the observed gamma rays and the density of material in the clouds indicated the presence of one or more accelerators of cosmic-ray protons in that region. However, the nature of the source remained a mystery. Fig. 2: (a) H.E.S.S. γ-ray excess map of the Galactic Centre region. The black lines outline the regions used to calculate the cosmic-ray energy density throughout the central molecular zone. White contour lines indicate the density distribution of molecular gas traced by its CS line emission. (b) Zoomed view of the inner ~70 pc and the contour of the region used to extract the spectrum of the diffuse emission. Deeper observations obtained by H.E.S.S. between 2004 and 2013 shed new light on the processes powering the cosmic rays in this region. The unprecedented amount of data accumulated over the last ten years of the H.E.S.S. observations, and the progress made in the methods of data analysis enables us to measure simultaneously the spatial distribution and the energy spectrum of the parent protons. Using the maps of the gas distribution in the CMZ, we found that the density of these protons has an almost spherically symmetric distribution but drops with the distance r to the Galactic Center following closely a 1/r law (see Figure 3). This distribution is characteristic of central source (located somewhere within 10 pc of the Galactic Centre) injecting accelerated protons continuously (on a 1000 to 10,000 year timescales) into the ambient medium. After injection, these protons propagate diffusively interacting with the CMZ gas, producing neutral pions, which then decay producing γ-rays and other sub-products. Fig. 3: Spatial distribution of the cosmic-ray density versus projected distance from Sgr A*. Each point corresponds to a region in Fig. 1. Fits to the data of a 1/r (red line, χ2/d.o.f. = 11.8/9), a 1/r2 (blue line, χ2/ d.o.f. = 73.2/9) and a homogeneous (black line, χ2/d.o.f. 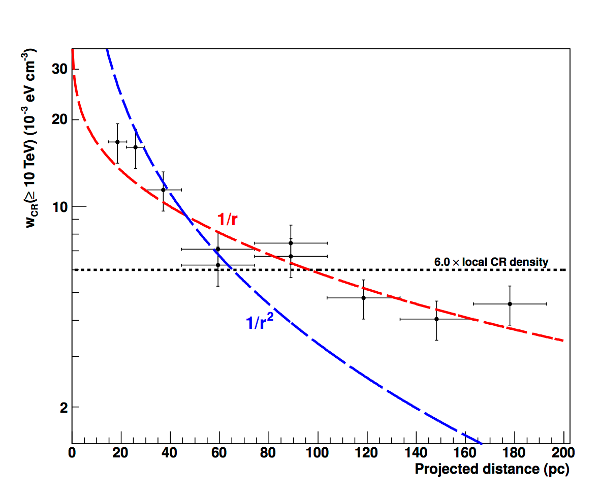 = 61.2/9) cosmic-ray density radial profile integrated along the line of sight are shown. The energy spectrum of the diffuse γ-ray emission measured by H.E.S.S. 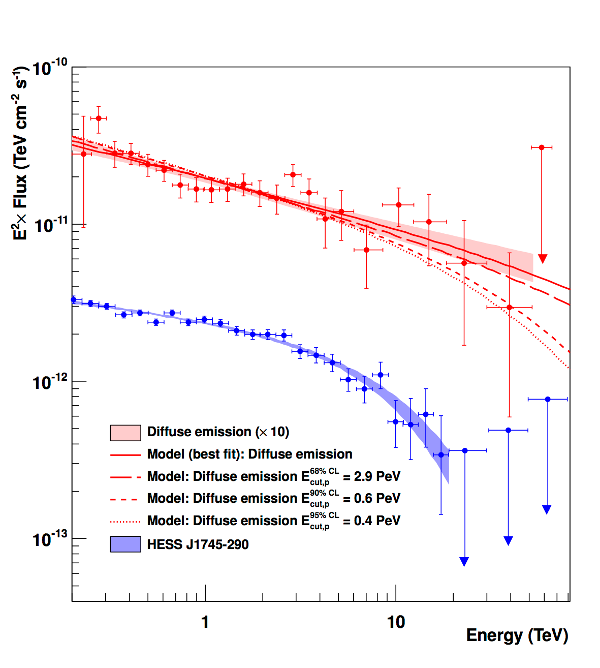 follows a power law extending with a photon index of ~2.3 to energies up to tens of TeV, without a cut-off or a break (see Figure 4). This is the first time that such a γ-ray spectrum, arising from proton-proton interactions, has been detected. Since these γ-rays result from the decay of neutral pions produced by these interactions, the derivation of such a hard power-law spectrum implies that the spectrum of the parent protons should extend to energies close to 1PeV. The best fit of γ-ray spectrum from neutral pion decay to the H.E.S.S. data is found for a proton spectrum following a pure power law with an index of ~2.4. Assuming a cut-off in the parent proton spectrum, the corresponding secondary γ-ray spectrum deviates from the H.E.S.S. data at 68%, 90% and 95% confidence levels for cut-offs at 2.9 PeV, 0.6 PeV and 0.4 PeV, respectively. This is the first robust detection of a Galactic cosmic Pevatron. Fig. 4: VHE γ-ray spectra of the diffuse emission and HESS J1745-290. The vertical and horizontal error bars show the 1σ statistical error and the bin size, respectively. Arrows represent 2σ flux upper limits. The 1σ confidence bands of the best-fit spectra of the diffuse and HESS J1745-290 are shown in red and blue shaded areas, respectively. The red lines show the numerical computations assuming that γ-rays result from the decay of neutral pions produced by proton-proton interactions. The fluxes of the diffuse emission spectrum and models are multiplied by 10 to visualy separate them from the HESS J1745-290 spectrum. The centre of our Galaxy is home to many objects capable of producing cosmic rays of high energy, including, in particular, a supernova remnant, a pulsar wind nebula, and a compact cluster of massive stars. However, the supermassive black hole located at the centre of the Galaxy, called Sgr A*, is the most plausible source of the PeV protons. Several possible acceleration regions can be considered, either in the immediate vicinity of the black hole, or further away, where a fraction of the material falling into the black hole is ejected back into the environment, thereby initiating the acceleration of particles. If that is the case, the derived particle acceleration rate should exceed the current bolometric luminosity of Sagittarius A* by two or three orders of magnitude and would constitute a significant, as large as 1 % fraction of the current accretion power of the supermassive black hole. The process of particle acceleration should thus be considered as an important element in the paradigm of accreting black holes. 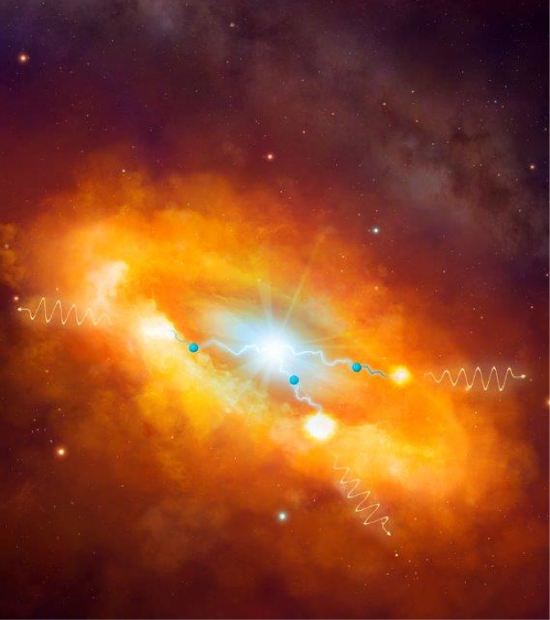 Sgr A* went through very active phases in the past, operating at a much higher accretion rates, as demonstrated by X-ray outbursts and giant outflows from the Galactic Centre. Thus, although its current rate of particle acceleration is not sufficient to provide a substantial contribution to Galactic cosmic rays, if powered by Sagittarius A*, this extreme accelerator could have plausibly been more active over the last 106–107 years, and therefore should be considered as a complementary source or even a viable alternative to supernova remnants as a source of PeV Galactic cosmic rays. If true, this would dramatically influence the century old debate concerning the origin of cosmic rays. H.E.S.S. collaboration, Aharonian, F. et al. Discovery of very-high-energy γ-rays from the Galactic Centre ridge. Nature 439, 695-698 (2006).